Thee well-credentialled fillies to race at Ballarat for the team on Tuesday. Bonnieux is the first to go in race two, the Fillies and Mares Maiden over 1100m while Kariya and Anastazi Princess both run in race four, the 3YO Fillies Maiden over 1400m. Bonnieux is resuming and Mike Moroney is happy with the way the daughter of Choisir has trained. “We’re pleased with the way she’s come back - she’s bigger and stronger this time around,” Moroney said. 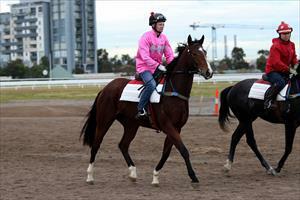 “She showed ability in her debut run last year but I’m expecting improvement this campaign. “She’s got good gate speed so I’d say we will try and take advantage of barrier one. Kariya (pictured) had no luck on debut at Pakenham on January 18 and Moroney is happy with the way the daughter of All Too Hard has trained on. “She’s come on from that run but still has some improvement in her,” Moroney said. “I think with a clear run in the straight last time she finishes first four but she lugged in and didn’t really help Patrick. Anastazi Princess debuts in the same race as Kariya and Moroney said the daughter of So You Think will benefit from the experience. “It looks a nice race for her to start off in and she’s drawn nicely,” Moroney said. “She’s a big staying type of filly who has taken a bit of time to work things out and is still not quite there. Patrick Moloney is aboard Bonnieux and Kariya with Jason Benbow to ride Anastazi Princess.